“Car Guaranty Co.” by Mehdi Ghadyanloo. As the leaves change, so, too, must the Rose Kennedy Greenway’s mural. 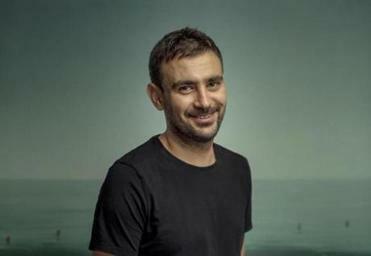 On Friday, Iranian artist Mehdi Ghadyanloo will begin work on “Spaces of Hope,” the fifth work to grace the Greenway Wall at Dewey Square Park since its inception in 2012. Cowan noted that the theme to which he and his team have hewed in shaping their 2017 curation — variations on “perspective,” visually or historically — meshed well with Ghadyanloo’s style. 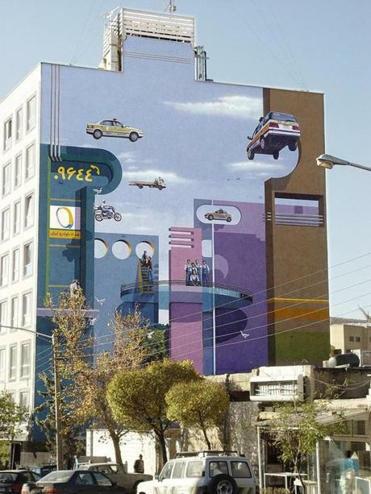 The artist’s public work in Tehran makes use of optical illusion and surrealist subject matter, while also reflecting his upbringing in the Middle East. One of Iran’s most prolific practitioners of public art, Ghadyanloo has painted more than 100 murals throughout Tehran. Before pursuing painting at the University of Tehran, he was a farmer. Besides producing “Spaces of Hope” (his first American work), Ghadyanloo will also display a complementary painting at Boston City Hall. On Wednesday, he’ll introduce a retrospective exhibit of his work at Lesley University’s Lunder Art Center, with a public lecture, the first in a nationwide circuit. The mural is a departure for the Greenway Conservancy, too, as the organization’s first solo curation for the 70-foot-by-76-foot wall. The 2016 mural, Lawrence Weiner’s “A Translation From One Language to Another,” was created in conjunction with the MIT List Visual Arts Center. Previous murals included curating help from the Museum of Fine Arts and the Institute of Contemporary Art. But since the changing of the wall can touch nerves regardless of who picks the new one — the response to Weiner’s piece was especially varied at first — all involved are keeping the subject of the mural to themselves, in hopes of arousing greater interest. Cowan was even less specific. While unforthcoming with the details, Cowan insisted that Ghadyanloo’s progressive style will further what he sees as the Greenway’s unique mission in a city steeped in history. For Ghadyanloo, crossing the ocean to bring his own ideas and visions to the Greenway Wall isn’t as big a journey as it might sound. Joe Incollingo can be reached at joe.incollingo@globe.com.